It is with great sadness that we announce the death of Anna Rhyne, a great friend of the North Carolina ballooning community for many years. Anna and her husband, the late Raeford Rhyne, were great supporters of those who started the Balloon Works, now Firefly Balloons. They rented their chicken house to Balloon Works, beginning balloon manufacturing in Iredell County. Anna never lost her love for ballooning and would never turn down the chance of a balloon ride. Anna also had a love for Tweetsie Railroad, which she visited whenever she was able. 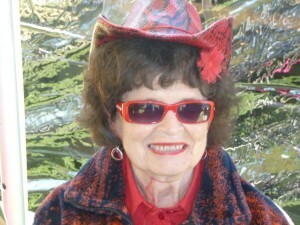 She was known as Tweetsie’s Lady in Red. Arrangements for her memorial service are incomplete at this time, but we will update here as they are known.